Target shooting and hunting are more popular than ever, and it’s no surprise that you’ve decided to get a rifle yourself. However, as much as ‘shooting’ might be the more difficult part in comparison to the actual browsing and choosing the right parts, the latter is not so simple. Namely, there are tons of mistakes people make when they start looking for their scope, and we’re here to state a couple of the most common ones so you can avoid and prevent them from happening beforehand. Perhaps the most obvious mistake you could possibly make is actually buying a wrong type of scope. There are different brands, different models, and in fact, there are even different types of scopes that could consider, and logically – not every scope is adequate for all rifles and purposes. That basically means that the first issue you need to address is the purpose of your scope. There’s only a few scope models that are actually good for various purposes – there are differences between target shooting and hunting scope models. So, what’s important for you to understand as a beginner ‘shooter’ is that there are three types of scopes – tactical, hunting, and target scopes, each being suitable for different kind of rifle using, for a lack of better terms. Even though we did mention the three categories of scopes, there are also numerous specific sub-types. For example, if you intend to go deer hunting, you don’t need those extraordinary features such as compensators, parallax adjustments, mil-dot crosshairs, a huge objective, and such. Scopes come with different features, and you need to be careful about which ones you actually need and which you don’t. This could also mean losing a substantial amount of money, as ‘buffed up’ models usually do cost quite a lot, but the vendors might persuade you into thinking you ‘need this or that’. This specifically applies to beginners, as there’s a high chance that you won’t even be able to understand how certain features work. Here we have a diametrically opposite situation – a scope that’s ‘simply too simple’ might actually not be suitable for the intended job. You may be an immediate beginner that just got into the business of target shooting aiming for the Olympics, but the first scope you get will usually be the one that you’ll stick with for quite some time. When you set out to buy a scope as a beginner, you usually think that ‘bigger is usually better’ in terms of scope magnification, that with bigger magnification you’ll be able to improve your accuracy. Sadly, that’s seldom the case. One of the most realistic scenarios is where cheap scopes actually do have a high magnification setting, however it’s usually provided by cheap glass materials. In a similar situation where the glass is actually great, cheaper scopes with absurdly high magnification tend to put up a small FOV (field-of-view). The reasons why ‘low magnification scopes’ are meant for only a number of specific purposes is obvious – short range shooting is extremely hard with a scope with high magnification, short-distance hunting where rapid reaction is necessary might even be dangerous in such a case. The crosshair is one of the most important features of a scope, and picking a wrong reticle might mean that you won’t be able to fix the accuracy issue of your rifle. Even if the scope is of magnificent quality, a bad crosshair might make it completely useless. For target shooting, mil-dot and Horus reticles are ideal, for hunting you can use a duplex or classic reticles. On another hand, there’s a specific type of reticle called the ‘ranging reticle’ – it’s mainly used to measure the distance between yourself and the target, taking account the degree of the bullet drop in some cases. This type of reticle is recommended for veterans who have some experience with scopes, but most certainly not for beginners. We’ve briefly mentioned what would happen if you got a scope made of cheap glass, but let’s elaborate with a bit more detail this time around. 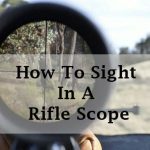 Namely, regardless of whether you need a scope for short or long range target finding or hunting, a scope made of cheap glass can make your rifle absolutely useless. The cheapness of the glass materials used can manifest through hazy images, or even mirage in certain scenarios, so it’s only obvious that you shouldn’t hope of hitting anything in this case. A scope made of decent quality glass materials is usually a few dozen (or even a couple hundred) dollars more expensive than budget models, but the main difference between the two is that the latter can be a complete waste of money. Scopes can be customized so heavily that your rifle can easily start to look like stuff from Sci-Fi movies. Namely, there’s all kinds of scope accessories you can use, and neglecting this fact will leave you with an old-fashioned scope – if you intend to participate in competitive shooting, you’ll just be outplayed, and if you go with un-customized scope to hunt, you’ll have a slightly more difficult time than everybody else. Accessories such as sun shades and flip-up caps, rubber plugs, anti-glare optics are all invaluable to every shooter, so make sure to check out what’s new on the market, what you need, and what you can actually afford. One of the best things about scope accessories is that the majority of them are rather inexpensive. Of course, you should skip those types and models that won’t complement your ‘shooting style’ (competitive range shooting, amateur target practice, big game hunting, casual hunting), but luckily, most brands actually point out which scope accessory is good for shooters at which levels.